In the Jacobs Lab we investigate how genomic evolution has shaped and rewired gene regulatory networks involved in human brain development. 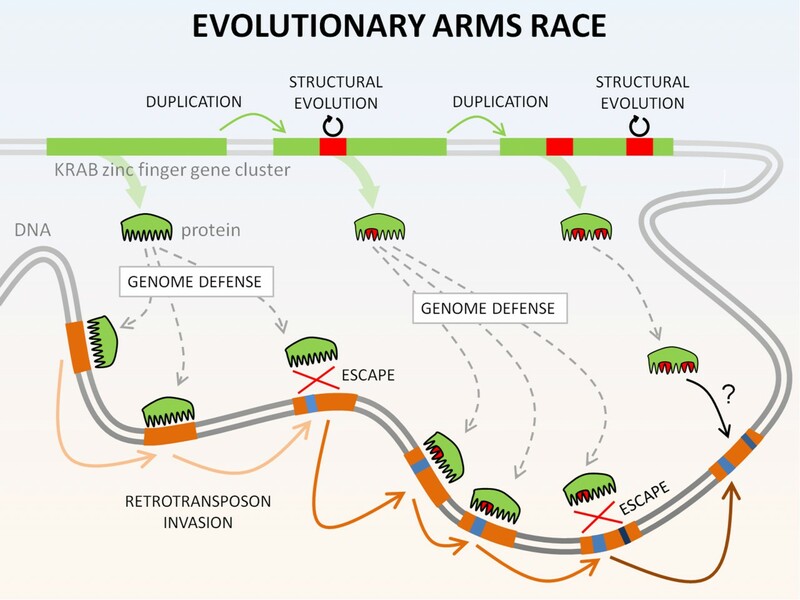 In previous work (Jacobs et al., 2014; Nature) we showed how KRAB zinc finger genes in our genome are in a continuous battle against retrotransposon invasions, revealing how our genome is actually in a war against itself. As a result of this evolutionary armsrace, both retrotransposons and KRAB zinc finger genes become heavily integrated in pre-existing gene regulatory networks, adding an extra level of complexity to how, where and when genes in our genome are shut on or off. Evolutionary arms race between KRAB zinc finger genes and Retrotransposons. The ongoing battle within ourselves, driving genomes to become increasingly complex, as they evolve mechanisms to fight off ever-changing elements of their own DNA. Our lab currently investigates how this extra layer of retrotransposon-mediated gene control has re-shaped gene regulatory networks involved in human brain development. Our research aims to pinpoint how specific classes of transposable elements have contributed to the evolution of human neuronal gene expression networks and understand how these changes may relate to human's increased susceptibility to neurodevelopmental disorders such as Autism and Schizophrenia and human neurodegenerative diseases such as Alzheimer's and Parkinson's disease.